Never Enough Nails: 300 Follower GIVEAWAY!!!!! It's time for my 300 Follower Giveaway!!!!! And I'm giving away one of my personal favorites of this fall! 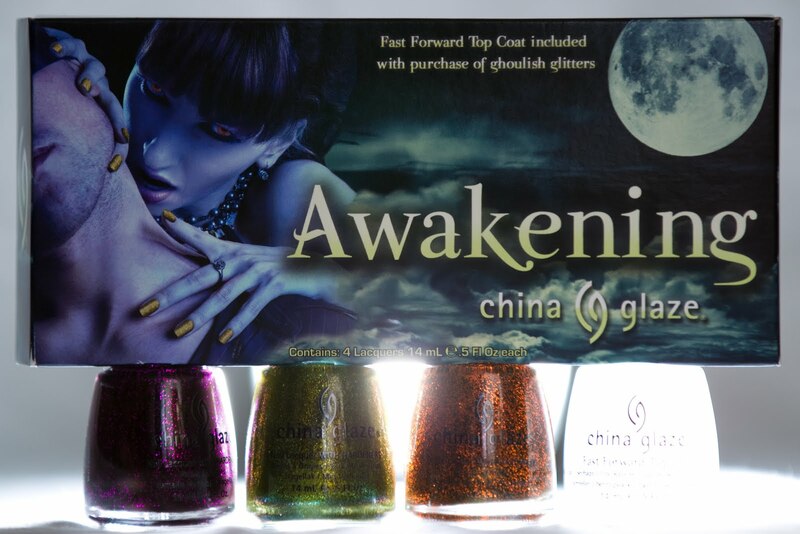 One lucky winner will take home the China Glaze Awakening Halloween set! This set includes one bottle each of Zombie Zest, Mummy May I, Ick-A-Bod-Y!, and Fast Forward Top Coat. For swatches of these polishes, see my review of this collection. The contest will end on Sunday, September 19, at midnight EST. The amazing pictures in this post were taken by my photographer boyfriend. He wanted to do one picture with the red lighting to go with the whole vampire/zombie theme. Cool, huh? If you're into photography, go check out Behind the Lens, his brand new photography blog. Good luck and thanks so much for reading Never Enough Nails!!!! pick me because i'm firstttt/awesome. it's absolutely corking to see you. spiffing, really. miffles. HAHAHAHHAHAHHAHAHA thank you. You just made my day, once. twice. a minute. all summer. I follow both via GFC and Twitter. I added you to our blogroll at Manicure Mommas. My favorite fall polish right now is probably China Glaze's Hey Doll. I'm a follower on both GFC and Twitter. I love Chanel Vamp. It's such a gorgeous colour year round but especially in the fall. I follow you via GFC as Ivana. My favorite fall polish is ChG - Mummy May I! I'm a GFC follower and you are added to my blogroll. Hi! I'm following you via GFC, my email's cherylcherylcheryl at gmail dot com, thanks! I am loving Chanel's "Khaki Vert" even though I don't own it. Thanks for the giveaway & the followers!!!! I follow you via GFC as *Fleur*, and I also follow you on twitter as Fleurs_nails. My email is fleurs dot nails at gmail dot com. I'm a photography lover, so i'll check your bf's blog out! Ooooo, please enter me! I believe I'm a twitter follower (Millie103) and GFC follower (Millie). It's spring here but my new fave polish is OPI Ski Teal We Drop. I follow on Google and Twitter. I'm loving Zombie Zest a lot. Good luck everyone and thanks for entering! I love reading about your favorite fall polishes too, so keep 'em coming! I'm a follower via gfc as Helena. My favorite fall polish is ChG Mummy May I. Awesome giveaway! Congrats on hitting 300 followers, that is so great! My fave from this year is Zombie Zest... but i fear thats only because I have a slight obsession with zombies. Its the first zombie polish I have ever seen. I would guess there are others but I have yet to know of them. I just added you on GFC, and you have been added to my blog roll page as well as your contest was added to my contest page. My #1 fall lemming is Essie Sew Psyched but there are sooo many! I'm a follower with google and twitter (nachtfee). My fav fall polish is opi diva of geneva. I follow via GFC and twitter. My favorite polish right now is CG Classic Camel. 2) I love China Glaze's Emerald Sparkle as my falls polish. Hello! I follow via Google Friend Connect! I love Posh Polish by Eyeko! I posted your giveaway here: http://msbubuandhergirlyness.blogspot.com/2010/09/giveaways.html and i also added your blog to my blogroll! Awesome giveaway! Thanks for the opportunity! I follow via GFC, under the name Kate B. I'm really digging Lucerne-tainly Look Marvelous by OPI this fall, because it's so chic and gorgeous! I like China Glaze's Emerald Sparkle a lot, but I don't have it.. I love Ingrid for this Fall! I'm in love with Ick-A-Bod-Y! nail polish from this collection. It's perfect for fall-winter! My fave fall polish is definitely zombie zest! I am your follower Lucisek-Lucy's Stash via GFC and LucysStash on twitter. The fall polish I adore is OPI Diva of geneva! Just amazing colour! sou seguidora do teu blog e postei na barra lateral do meu blog o teu sorteio. My favourite fall polish is probably Rimmel's Grey Matter. I'm really into greys at the moment, so that's probably why, haha. Hi, please enter me too! - My fav fall polish of the moment is Essie Sew Psyched, it's a new and interesting color and stands apart from the perpetual fall staples like grey and plum. Thank you for hosting this great giveaway! The fall polish I am currently loving would be a tie between OPI Glitzerland and Orly Space Cadet. Hi! My favourite fall polish is a grey that i made myself! My fall polish at the moment has to be China glaze - Foxy, I <3 it! thank you for hosting this cool giveaway! Hey! I'm a new follower via GFC (Lilith). I'm loving Zombie Zest although i don't own it yet. That green is just amazing! Thanks for a great giveaway. I'm a follower on GFC. I love these colors. Hi! This giveaway looks wonderful! I would love to try this out and see how it looks on my nails. Thank you for this giveaway! My fall color I'd have to pick would be china Glaze Fitzgerald Emerald. Its so pretty. Thanks for this amazing giveaway! :)) I love Halloween collections. My favourite fall polish is China Glaze Who's Wearing What, a dusty lilac creme. I love dusty or grayed lilacs, purples, brownish purples and dark reds for fall. I follow via GFC (blanche.b at gmail dot com). Your blog is in my blog roll: http://polishdrop.blogspot.com and I added your giveaway in my sidebar. I follow you on google!! Now you are on my blogroll and I have add you giveaway on my blog! I follow you via GFC(Sofie) and via twitter(_Sofietjee_). My favorite fall polish will be China Glaze Midnight Mission, I love blues! I follow you via GFC as Claudia Mendonça. Thanks for all the entries so far!! I also am loving hearing your favorite polishes right now, I see some I will have to try! Hi! This fall I am loving on Mummy May I! I am lemming for it so bad but it's sold out everywhere! A polish I'm loving on this fall is China Glaze Jitterbug, it's sparkly and great :) Love the sparkles! You are on my blogroll and I made a post about your give away! My favourite Fall polish is Chanel Tendresse. Hi, I'm a new follower and I'd like to enter this giveaway. 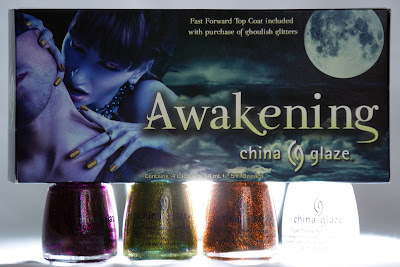 Especially I like China Glaze Mummy May I.
I'm a new follower, found this giveaway in another blog. sorry, may I enter a second time? it's first time I enter a giveaway and I'm excited, so in my first comment I did a fault. My favourite is China Glaze Ingrid. Well it's actually not autumn here it's spring! So I'm loving some of the pastels that are out and OPI's special release breast cancer awareness pink! Thanks for putting me in the draw! My new favorite Fall polish is OPI Ski Teal We Drop. It's amaaaazing. I love it. my fav fall color is ChG - Mummy May I! I am really loving 'too rich for you' by OPI for Gossip Girl! I'm a new follower, via GFC. It's an older color, but I really like Essie Wicked for fall. I added NEN to my blog roll at Alice's Restaurant. I also added you to my blogroll! I would love to enter this give-away :) I'm a follower through Google, vettelicous. I am absolutely LOVING the Halloween set from Chinaglaze this year (and want to try it out so badly) - but my favourite Fall polish is Paradoxal! following you on GFC by the username 'Ezzy' & following you on twitter @lilofeverything. I'm loving Orly's It's Not Rocket Science this fall !! Thanks for this giveaway! I am a follower and my email is glitterkitten at hellokitty dot com. Thanks everyone! Giveaway is closed, so stay tuned for the winner! That awesome lighting is courtesy of my photographer boyfriend! He says thanks!